The M2400 analog output module has up to four analog output channels (±10 V) and 16 digital inputs/outputs (24 V DC). The module is particularly suitable for the operation of four servo axes. Four analog velocity command values and the necessary auxiliary signals can be set and read. The fibre optics connection of the Lightbus system allows the transducer values to be transmitted at high speed and without interference to a central device such as a PC, PLC or CNC within 25 µs. 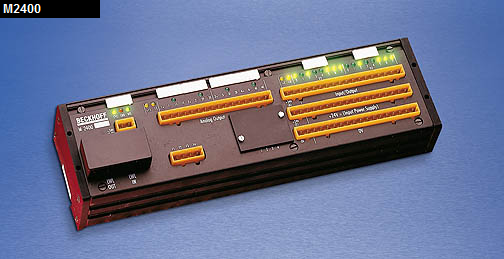 Just one 24 V DC power connection, auxiliary voltages are generated on the module. All connections are of plug-in type.